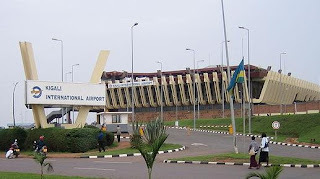 12 November 2009; RwandAir CRJ-100ER; Flight 205; Kigali, Rwanda: A RwandAir CRJ-100ER was on a scheduled flight from Kigali, Rwanda to Kampala, Uganda, ran into a terminal at the Kigali airport, killing one of the passengers. All three crew members survived, but one of the 10 passengers was killed. The aircraft reportedly had and unspecified engine problem shortly after taking off and the crew returned to the airport. According to eyewitnesses, the plane first taxied to a parking position on the apron, but then accelerated, knocked over blast fences, and hit the concrete wall of the airport building containing the VIP lounge. The nose gear collapsed and the forward portion of the aircraft penetrated the building up to about the position of the forward passenger doors. According to the airline, the aircraft involved in the crash was leased from the Kenya-based airline Jetlink Express. The tragedy was not limited to the crash site. A Rwandan newspaper reported that an ambulance carrying one of the injured flight crew members struck and killed a pedestrian while transporting the crew member to a local hospital. This was the third fatal plane crash that killed a passenger on a CRJ jet. The most recent fatal event was a 27 August 2006 crash of a Delta Connection CRJ-100 at Lexington, KY. Two other CRJ passenger jets have been destroyed in crashes, and in one of them the captain was killed. The following is a statement from RwandAir on the accident at Kigali International Airport where flight number WB205 bound for Entebbe taxied and hit the VIP building. This flight was operated by Jetlink Express Limited on behalf of RwandAir. 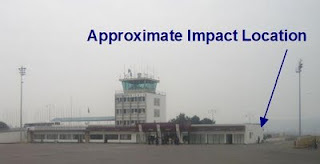 At 1240hrs yesterday flight number WB205 took off for Entebbe with 9 adults and an infant. A crew of three - captain, first officer and an engineer manning the flight and two RwandAir flight attendants were on board the flight. Two minutes into the flight, the Captain called the control tower asking to land back because of a technical problem with the engine's thrust lever (throttle). The aircraft safely landed and taxied into the parking bay. However as the ground crew went to put on the back wheel chocks, the aircraft suddenly accelerated, turned right and hit the eastern wall of the VIP building after covering a distance of about 500 meters. After hitting the wall, the flight attendants aboard the aircraft initiated an evacuation sequence and the passengers escaped through the over-wing emergency door and walked away from the aircraft to the terminal building. The Crash and Rescue team at Kigali International Airport ensured that all the passengers and crew were rushed to King Faisal hospital for evaluation and observation as needed. The entire crew has been tested for substance abuse. Of the passengers rushed to the hospital, six passengers were immediately discharged after evaluation. While two passengers went home, three others were put in hotels by RwandAir. One passenger departed for Entebbe on RwandAir flight number WB105 last evening. Three others flew out this afternoon to Entebbe. One passenger sustained two broken ribs and a punctured lung and is admitted. The passenger who is the mother of the infant was kept overnight for observation while family members took the infant home, she has also been discharged today. It is highly regrettable that one passenger died in hospital, the cause of death is yet to be determined. However, RwandAir is in touch with the family and is assisting with the funeral arrangements. While the cabin attendants were treated for minor injuries and discharged, the cockpit crews are still admitted at the hospital. The Captain sustained a broken leg, the First Officer sustained a broken ankle and the Flight Engineer had bruises but was kept for observation. The management of RwandAir would like to commend, the management and staff of King Faizal Hospital for their efforts in assisting with the patients in their care. The airline is maintaining dialogue with each of the passengers who were on this flight to ensure all the after effects of this incident are dealt with amicably. The aircraft involved in this incident is a bombardier manufactured 50 seater Canadian Regional Jet -100 series. The aircraft registration number 5Y-JLD is registered in Kenya and owned by Jetlink Express Limited which was operating flight number WB205 on behalf of RwandAir at the time. It is worth mentioning here that prior to getting into lease arrangements with Jetlink Express, RwandAir along with Rwanda Civil Aviation Authority (RCAA) as the aviation regulator, conducted independent audit of Jetlink Express, her maintenance facilities and crew capabilities to determine safety and airworthiness of the operation. All operations with the Jetlink CRJ aircrafts have been suspended while investigations of this incident are ongoing and RwandAir passengers have been rebooked through partner airlines. Note that only flights to Johannesburg and Nairobi have been affected by this suspension. However flights to Entebbe, Kamembe, Bujumbura, and Kilimanjaro will be operated as normal but with time changes. All passengers booked are advised to contact any RwandAir office for travel information. Soon after the aircraft taxied into the VIP building, and after the evacuation, different organs at the airport concerned were swift to deal with the wreckage and ensured that any potential danger to the airport was contained. After long hours of careful efforts and amid heavy rain the wreckage was moved to a safe area away from the operational area. RwandAir is thankful to RCAA management, the security organs, all men and women who worked until midnight to resolve this problem. The accident investigations started immediately after the accident and will be headed by Kenya Civil Aviation Authority (KCAA) who licensed the aircraft, supported by RCAA who own the accident scene and we recommend that the FAA (Federal Aviation Administration) be invited as a neutral party to help with the investigations. Over the last few months, RwandAir has been working vigorously towards the acquisition of its owned fleet of aircrafts delivery of which is scheduled before the end of the year. Over the next few days, the airline is going to fast track the delivery of these aircrafts. In her bid to ensure the highest standards of safety, RwandAir has secured and retained the maintenance services of Lufthansa Technic for its expected fleet. Further, to head her technical and flight operations going forward the airline has retained qualified and experienced personnel like the Chief Pilot who has over 17,000 flying hours with renowned airlines and the Director of Operations with over 40,000 flying hours. RwandAir would like to reaffirm its commitment to upholding the highest safety standards and would like to see this incident swiftly investigated so that its esteemed customers and the public are reassured of continued and reliable safe operations.